Since information from Caterpillar is always held very tight within the family it was very hard to get an accurate history of how the relationship all came about, so if I’m a bit off in my timeline, forgive me. I assure you, it won’t affect the content of this article. The bottom line is, Ford had a truck line with mammoth 477 and 534 cid gasoline engines and realized it needed a diesel for its fleet vehicles if they wanted to stay in the game. Somewhere in the late 1960s or early ’70s Caterpillar seemed to have an interest in getting into the medium duty fleet truck engine business, or Ford coerced them into it  opinions vary as to which is the most likely scenario. The point is, Ford had the trucks and Cat had the engines. From 1968-1974 The Ford 6000 series trucks used the Caterpillar 1140 150 hp and 1145 175 hp diesel engines. In that same time, the 7000 and 8000 series had the Cat 1150 200 hp diesel. These early renditions were considered inexpensive “throw away” engines. There were very few oversize or undersize parts available, at least from the OEM. Obviously those were different times and certainly part of a much more vibrant economy, however the entrepreneurial spirit of engine remanufacturers and the automotive aftermarket never accepted the “disposable engine” mentality and so the story continued. The 1160 was in the 8000 series Ford back in 1968 as well but became a lot more popular in 1970-1974. Then in 1975 the 3208 showed up in 7000 and 8000 series trucks and in the ’80s gained phenomenal popularity. There was hardly a city fleet anywhere in the country that did not have a Ford with a 3208. Whether in city tractor trailers or garbage trucks they were everywhere. They also gained popularity in marine applications, power plants, school buses and construction equipment: if it needed a medium duty diesel engine, the 3208 was the one. Ford and Caterpillar hit a home run with this combination, a partnership that lasted all the way through 1990. If my sources are correct 1992 saw the end of production, but there are still a lot of these engines out there. As I said, Cat plays a lot of things close to the vest, so I was never able to get exact production numbers so I can only venture a guess about how many of them are still being used. Especially in today’s frugal economy, and I have not heard of a “Cash for Cat” program. There is one thing that I would highly recommend, though, if you have any intention of working on, repairing or remanufacturing a 3208 or any Caterpillar engine: buy the Caterpillar manual. Caterpillar manuals are stellar and you will never find better information or specifications but they are justifiably proud of them and you will pay a premium. With all that in mind, let’s dive right in and look at the pieces of the 3208. The turbo block has two vents for the lifter chambers of the block that the non-turbo does not have. Figure 1 shows the rear lower extremity of the “V” of both blocks. The non-turbo block is plain and just follows suit with the rest of the casting. The counter bored and threaded hole (red circle) is where the camshaft thrust bolt is installed. The turbo block on the right has a cast and machined turbocharger mounting flange in the rear of the block at the bottom of the “V” with oil feed and drain back in between the mounting bolt holes. In the rear of the blocks you can see the last cam bearing bore and the main oil galley plug threaded bore just above it and you get a better view of the breadth of the mounting boss. You also need to pay attention to the #1 main bearing housing bore register in the block. If it has a center bearing tab locator (Figure 2) you will use the three hole main bearing since that register also has a groove cut into it. If it has the offset bearing locator tab in the main bearing housing bore the block will have a plain single hole main bearing bore register. Turbo blocks also have piston-cooling jets/nozzles that feed off of the main bearings (see Figure 3). You may find non-turbo blocks that have been machined for these nozzles but actually have plugs installed. Early 3208 non-turbo blocks had a slightly steeper main bearing cap parting line angle. I was unable to determine a serial number break as to when that happened but if you’re salvaging main caps for block repairs you will want to be aware of it (see Figure 4). One worldly piece of advice on main caps: they need to be tight in the register in the main saddle. If you have a cap that is loose (one that slides in and out with little or no resistance), it has stretched and is out of round. If you have a main cap that is “kind of” loose but still measures in spec, you will probably have a premature main bearing failure at that location. If the caps are tight enough that you need to struggle to get them out of the register, preferably having to wiggle them back and forth, you will be perfect. If you need to, reclaim the register area of the cap and mill the register face back to a dimension that will keep the cap good and tight in the block register. Then align bore the block, but remember that you have a stacked gear train with this engine, so you shouldn’t be moving centerlines if you want your gears to work. I know that this information is a “feel” dimension and I have not given you a specific press fit but I am unaware that there ever was a published specification, I can only share a “school of hard knocks” lesson. The 3208 engine utilizes a forged steel crankshaft with true ground radii  they are not rolled. Pick this crankshaft up once and you will know why they are not. There was no scrimping on metal on this Caterpillar crank. You can have an 8- or 10-bolt flywheel flange (Figure 5) and they both have the same bolt pattern. If you use an 8-bolt flywheel on a 10-bolt crankshaft be sure to install two plugs with sealer into the unoccupied holes or you will leak oil badly. There is a somewhat unique oiling to this crankshaft the connecting rod oil holes join to one common oil passage coming from the main journal to the rear of it. So the 1-2 rod throw is oiled by #2 main, and so on. Therefore, the #1 main bearing journal does not feed any connecting rods and does not have an oil hole in it. Crankshaft thrust endplay is controlled at the #4 main bearing position and it uses one single bearing half that is flanged to control crankshaft endplay. This engine is externally balanced so make certain that flywheel index is correct. In its first iteration, the 3208 was a naturally aspirated engine with a flat tappet/lifter camshaft made of cast iron. Take a look at Figure 6 and you’ll see this camshaft in the middle (letter B). The end of the camshaft has an inset photo to help you identify the lobe profile. The second camshaft was the flat tappet cam in the turbocharged engines and is identified by the letter A. Again the lobe profile is superimposed on the end of the camshaft. Take note of the much gentler lobe peak profile  this is also a cast iron camshaft. The last and final camshaft (letter C) was the roller lifter camshaft. Made of steel, this camshaft is hardened to withstand the point contact of the roller lifter. The lifters are readily identified by their appearance and there is nothing too confusing about these (see Figure 7). In the center is the roller lifter and on the right is the flat lifter. The roller lifter is used in combination with the steel camshaft. The roller lifter is secured in the lifter bore with a clip to prevent it from turning. These are mechanical lifters only: there are no hydraulic lifters used in a 3208 engine. There are three different connecting rods used in the 3208, and as with all the other components what you’ll use depends on what you have. Figure 8 explains the differences. The first series connecting rod is shown on the left. This rod is used with a piston that has straight-sided wrist pin bores in the ID of the piston (see Figure 11). The second connecting rod was a tapered pin connecting rod used with pistons that had additional material up under the piston crown creating a tapered wrist pin boss on the ID of the piston. Many remanufacturers today will machine straight pin boss rods to a tapered pin rod to reduce part numbers and rod core management for naturally aspirated engines. You can put a tapered rod into a straight pin piston but not vice-versa. A word to the wise, however: even if you purchase the correct fixture tooling to install the tapered pin bushings you still run the risk of having a bushing turn in the rod eye (as a warranty) due to bushing distress and distortion. Heat the pin eye and nitrogen the bushing, index the bushing and drop it in the rod. The last connecting rod on the right is the turbo rod. This one features an enhanced beam and increased strength. The cylinder head for the 3208 is pretty uncomplicated and yet complex. The only real difference between the head casting for a turbo and non-turbo engine is that the lift bracket holes on the cylinder head are different. The non-turbo cylinder head is 3/8? x 16 pitch thread and the turbo head is 1/2? x 13 (Figure 9). That is the simple part, however when it comes to the valves, springs and valve seat inserts, that is dependent on the serial and arrangement number. Early 3208 engines used 6 ID dash lines on the head of the bolt and were torqued at 95 ft.lbs. while the 7 dash (one mark is a letter) head bolts are torqued to 110 and 120 ft.lbs., depending on their location. There have been three fuel injectors used on the 3208 engine (as shown in Figure 10). The one on the far left is referred to as the “S” injector because it was the injector used on the “40S” serial number series engines. You must use the hold down shown with this injector. It is .500? tall with a smooth OD of the spacer barrel. You will also need to use .063? ID fuel lines that you can identify by the smooth OD line nut also shown. The injector and components shown in the center belong to the “Y” injector because its use was primarily with the 32Y serial number series engines, although it did bleed into the 51Z engines as well and some turbo engines (02Z and 03Z). This injector requires a different hold down with a spacer that is .475? tall as indicated by the groove on the OD of the barrel. This injector also uses the .063? ID fuel line with the smooth line nut. Another quick identifier for these two injectors is the black gas seal on the “S” injector and the yellow seal on the “Y” injector (an easy way to remember is “Y” for yellow seal). The “7000” series injector is completely different in appearance and there is no chance of mixing this one up. This injector must use a .072? ID fuel line that can be identified by the “Notched” fuel line nut as shown. When this injector is used in the lower horsepower naturally aspirated 3208 engine it will have an injector tip orifice diameter of .290 mm and when used in the higher horsepower turbo engine the injector tip orifice has a diameter of .315 mm. Other diameters of orifice sizes are also used for various different specific applications. The piston bottoms shown in Figure 11 show the straight pin bore piston on the left that can be used with either a straight pin or tapered pin connecting rod. The piston on the right has the tapered pin bore and, as you can see, there is a substantial amount of additional support for the piston head. Only the tapered pin bore connecting rod can be used with this piston. The piston on the left of Figure 12 is a non-turbo piston with a fuel swirl bowl volume of approximately 54cc, while the piston on the right for the turbo is approximately 59cc. Mixing them up can render poor results in runability. The pistons shown are all three-ring pistons. Caterpillar produced a three-ring piston only for some turbo application but never for a naturally aspirated engine. Instead, two-ring pistons were used in these versions. The two-ring piston was only available as a conventional type ring groove while the three-ring pistons use a top Keystone ring (see illustration). Use the three-ring piston as your choice of piston: it’s a superior replacement for the two ring and you’ll never use a two ring in place of a three ring. Naturally aspirated pistons come with three different compression ratios: 16.5:1, 17.5:1 and 18.2:1. Turbo pistons primarily have a compression ratio of 16.5:1, though there are some lower horsepower turbo engines for California applications, which have a 17.5:1 compression ratio. In Figure 13 you can see that the CAT 3208 used one of three camshaft drive gears and three different type injection pump timing advance units. On the left, the narrow drive pin set for the advance unit (notice how close the pins are to the center hole of the gear) shows these gears are for a naturally aspirated engine. The unit in the center has the wider pin location for the cam advance unit and is used for turbocharged applications. Note that both of these timing gears have a higher count of teeth and a shallower profile. The gear on the far right is the last rendition with fewer teeth and a much more aggressive tooth pattern and was used for high horsepower applications. There are only two crank and injection pump timing gears. As shown in Figure 14 you’ll find either a fine tooth or a coarse tooth gear in this position. The 3208 diesel engine had three different oil pump gears. As shown in Figure 15 from left to right, the early shallow gear oil pump corresponds with the like front cover and pump bushing. The center gear is the taller, higher volume oil pump with the matching front cover and bushing as well. Both of these gears have the higher count shallow profile teeth and the last gear is the same height, however, it has the coarse, more aggressive tooth pattern. Since many of these components may potentially be changed out in the field, knowing the appearance of all of the variations could save a lot of grief and sorrow because an incorrect tooth pattern component was installed. The oil pump tooth pattern always has to be matched to the crank gear pattern. However you may find the tooth pattern can split between coarse and fine pattern on the same engine. Example: Crank gear, cam gear and oil pump fine gear pattern and advance gear and injection pump gear have a coarse pattern or vice versa. The 3208 Caterpillar engine has a fuel injection pump drive gear that is driven off the front of the camshaft. This drive gear will usually be an injection pump timing advance unit as well. This gear may also be zero advanced, used primarily in constant speed engine applications. When “0” advanced is used in naturally aspirated engines it is a solid gear and for turbo engines it will appear as any other advance unit, except it is marked as “0”. In naturally aspirated engine applications there are 3°, 5° or 8° advance units used. Turbo engines use 3.5° or 8° advance units. The dowel size and spacing are different between an advance gear for a naturally aspirated and turbo engine (see gear train info). The turbo dowels are bigger in diameter and further apart. The advance unit in the lower portion photo as shown in Figure 16 is an assembled advance assembly for a naturally aspirated engine that is 5° advanced, as evidenced by the 5 that may be scribed or stamped into the cover plate. Note the four red dots: these are the location of the 4 rivets that, when drilled out, expose the internals of the advance unit as shown in the upper portion of Figure 16. The four red circles at the top are those same drilled rivet locations. The upper portion shows a turbo advance gear, size of the holes in the slides and spacing. The weights (two red arrows) show the two sliding tapered parallels (note the 5 stamped on them) that are driven by two slides between them. Those two slides are driven by the two dowels off the front of the camshaft timing gear. As centrifugal force of the unit’s rotation speed increases the weights push against the force of the springs which will cause the slides to make a change in the angle correlation between the injection pump camshaft and the engine camshaft, thus advancing the injection pump timing the amount indicated on the face plate. The light blue arrows show the resistance springs. As shown in the inset image what looks like one spring is actually two, one fitting inside of the other. These can break and without drilling this unit open you will never know, until you get improper advance of the injection pump resulting in poor power or possible white smoking. The green double arrow shows you the center hub of the unit that has narrow ledges which centers in the cover plates. You can also see that if the narrow ledges fracture (inset image right) that will also result in improper advance action. These units were not designed to be disassembled but to be replaced, so if you are not inclined to drill and rivet, my suggestion is to replace. Just because it worked before does not mean that it will work again after the reman process. Lubrication oil for the timing advance unit comes from drilled holes that connect with the front bearing for the engine camshaft. The function of the advance unit can be checked with a dynamic timing device. Early 3208 engines used a Schwitzer turbo that required a riser that bolted to the block and the turbo then bolted to the riser (see Figure 17). This riser required ports for oil flow for the turbo and added an additional surface that could potentially have a leak. It sat higher and required more hood clearance. Air Research designed a turbo specific to the 3208 that mounted directly to the block and sat lower down into the valley (see Figure 18). Again the serial number and arrangement number will tell you which one that you have. They do not interchange without making a lot of modifications. Figure 19 shows the three most common bellhousings used on the 3208 engine. Bellhousing A is used on both turbo and non-turbo applications. It is an SAE 2 and is double-drilled at the top on the inside (which would be on the bottom of the image) this bell housing uses a paper gasket seal to the block. B is the early design SAE 2 used with non-turbo engines and is single drilled at the top for mounting bolts and also uses a paper gasket to the block. C is the latest light weight bell housing used and is also a SAE 2 and double drilled at the top and uses sealer only between the bell housing and block. There are some SAE 3 bell housings used in off-road applications and of course the serial number and arrangement number will give you that information. It is absolutely critical that the bell housing be dial indicated in relationship to the crankshaft for alignment prior to final torque. Failure to do so will result in bell housing fracture. The oil coolers on the Caterpillar 3208 came in three different varieties. Depending on the application and engine specification, the cooler cores can come with or without mounting studs (early style versus late style) as shown here. The oil cooler bases need to be matched up with the cores. To assemble a core without studs to a cooler base with openings for the tree studs, the base can be modified by plugging the holes with pipe plugs. All coolers incorporate a cooler by-pass valve and later styles also a filter by-pass valve. The 3208 engine can be a good contribution in your remanufacturing product line as evidenced by Reviva, in Minneapolis, MN, to whom I am again indebted for their hospitality, expertise and general attitude of sharing, a standard that many can aspire to. Their continued pursuit of excellence in the use of Kaizen and Six-Sigma implementation is awesome to watch in action. I also would like to make special mention of Franz Riesterer for his knowledge and insight of the 3208 engine. Roy Berndt has been in the automotive engine rebuilding and remanufacturing industry for over 30 years. 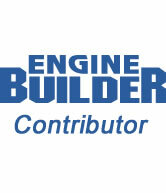 He is an ASE Master Machinist and co-author of SAE documents and Standards. He is the Program Manager for PROFormance Powertrain Products, a PER in Springfield, MO. [email protected].